Good movement as it loads flat then raises exactly like The Round Up for a great but gentle ride. The Paratrooper is a flat ride. It is average speed, fun, rerideable, it has a large capacity, and a long duration. Good among paratroopers...fine speed produces a fine sensation. As usual the surroundings are gorgeous. A fun, exciting ride for the family. The paratroopers ride gives you that weee!!! feeling in your stomach, much like the Gallion pirate ship ride, my feet were just inches from the tree limbs, and the way it swings you out and around, and up and down. Best paratrooper Ive been on. I love how the cars came very close to surrounding trees throughout the ride and I almost even could touch a few of them. Also, this was one of the fastest paratroopers Ive been on and therefore it seemed more intense than others and also Knoebels ran it with a very long cycle as well. The Paratroopers offer a greater thrill than it looks from the ground. They are a pretty fast, entertaining ride! I gave this an average for this type of ride. I dont think it is nearly as good as Indiana Beaches. I am not quite sure I can pinpoint why other then the locations. However, I did like the lights on this at night and we did have a little longer ride then normal. With that said still just an average. A very nice version of this ride, but I am not sure about the rare comments for this ride. I have now went on several just in PA alone. Not to mention a couple in the Midwestern parks. 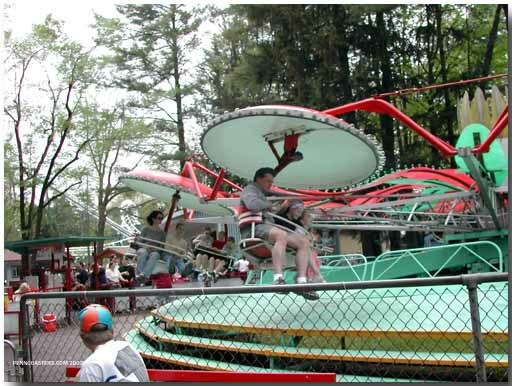 When compared to the others the only one that I think is worse than Knoebels is the modern looking one at Delgrossos. That does not mean this is bad its just that those are far superior. Especially IBs and Adventurelands.